Welcome back everyone, we are back on the street. 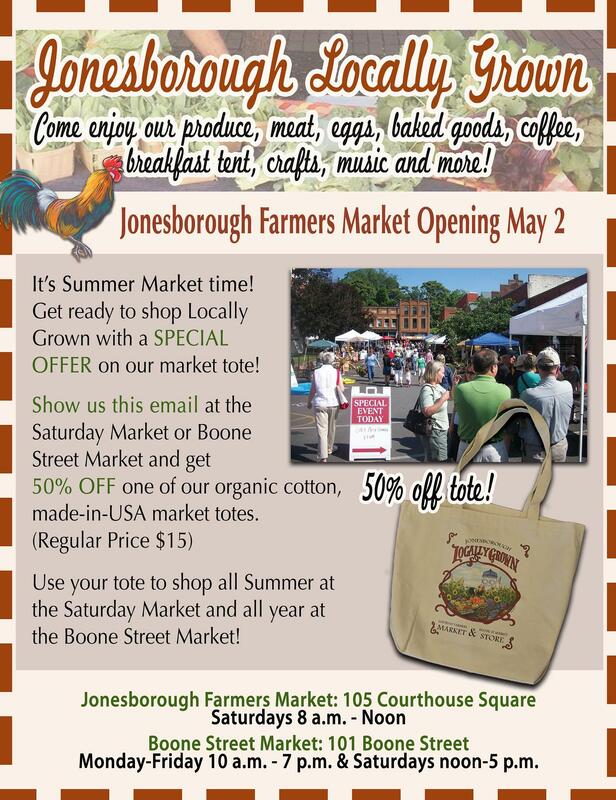 The Jonesborough Farmers Market kicks off its 8th season on Saturday morning! WOW…look at all the things you can find on our opening day! tomato plants, vegetable plants, herbs, flowers. Returning vendors: Perry Phillips, Eric Isenberg, Shy Valley. kale, lettuce, chard, garlic, asparagus, mint, watercress, ramps, leeks fava greens, pea shoots, collards, broccoli, arugula, onions, baby bok choy, shiitake mushrooms, strawberries, and microgreens! Returning vendors this week: Rogue Harbor Farm, Dominick’s Garden, Ranchito la Chiva, Salamander Springs Garden, Uncle Rob, Jane Matheson, White’s Mountain Meadow Farm. New Vendors this week: Millwood Greenery, Rural Resources. goat cheese, chicken, beef, pork, lamb and lots of eggs. Returning vendors this week: Ziegenwald Dairy, Clover Creek Farm, Shiny C Farm, Sentelle’s Homemade Sausage, Kany/Perservation Farm. breads, muffins, tamales, danishes, scones, chocolates. Returning vendors this week: Farmhouse Gallery, The Fig Lady, Dona Eva, Jane Wilson. pottery, goat milk soaps, quilted kitchen items. Returning vendors this week: Tim Robert’s Pottery, Rusty Barn Star. A special offer on our market tote bags! Good during May while supplies last! Favorite thing about the Jonesborough Farmers Market: visiting with all the people that come through, friends new and old. For tomorrow: Perry will have 10 varieties of tomato plants along with pepper plants, butterfly bushes and more. 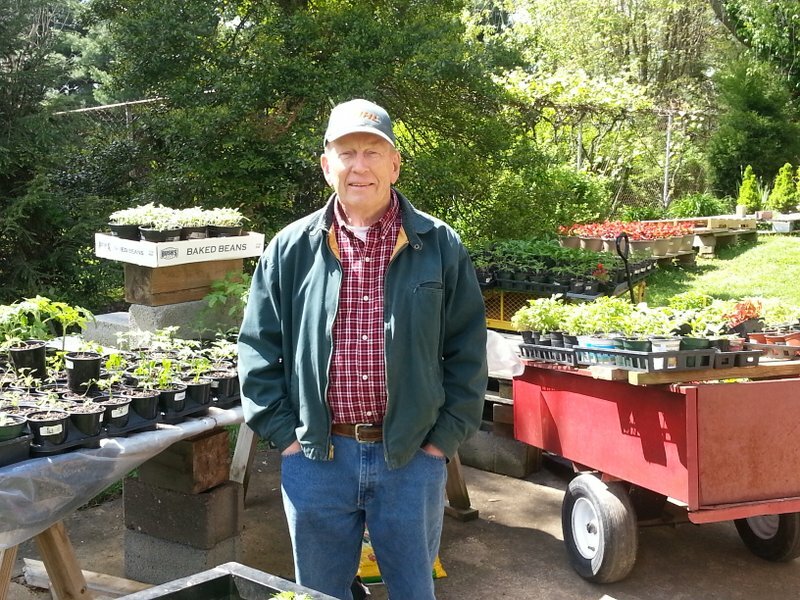 Stop and chat with Perry and get some growing tips on how you too can have healthy, beautiful plants.